As a video compression codec standard, H.264 is ubiquitous, whether in Internet video, Blu-ray, drones, camcorders, mobiles, tablets and everything. Aiming at reducing the bandwidth required for transmission of full-motion video, H.264 achieves it very well compared to MPEG-4. But as there pops up a new codec - HEVC, H.264 seems not so much superior both on compression ratio and size. So you do need reduce video file size by shrinking H.264. To be specific, compared H.264 to HEVC, the later saves 50% storage space by encoding video at the lowest possible bit rate while maintaining a high image quality. A minute of 4K video size at 30fps on iPhone is about 350MB for H.264, while only 175MB storage space taken for HEVC. To make it clearer, I picked up three video from my Photo Library of iPhone 8 which are all recorded in High Efficiency mode: a night video of a drone flying and then landing (44 seconds), a slo-mo video of a water-filled balloon bursting (37 seconds), and a longer video of my nephew's birthday party (six minutes 23 seconds). Compression isn't precisely twice as good with HEVC, but it's certainly a dramatic difference. The file sizes of HEVC files are consistently smaller, almost twice as small if not more than that. Since there's little to no quality loss, it's reasonable that an increasing number of people start to record HEVC videos rather than H.264 codec ones. But the fact is that quite a few of camcorders or cameras are competent of shooting HD or 4K videos in HEVC, more of them can only record videos encoded with larger-sized H.264, such as iOS 10-based iPhone, Samsung Galaxy S8, GoPro Hero 4 etc. To make the H.264 MP4 4K video smaller, it's best to compress and convert H.264 to HEVC, or adjust parameters like frame rate, bit rate etc. Here comes the in-depth guide to help you do so. There are many video shrinkers for Mac and Windows to get H.264 files smaller. 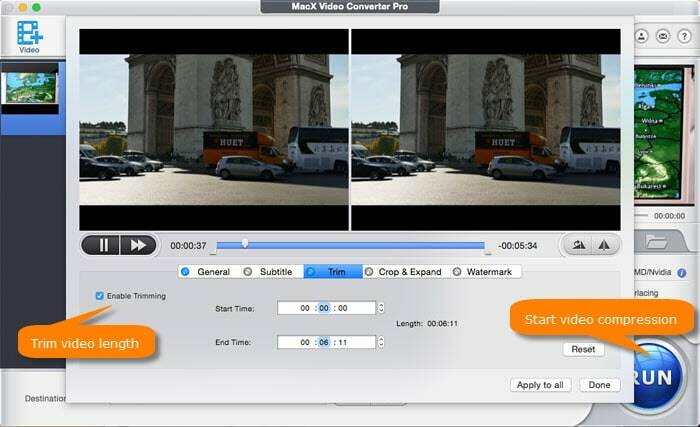 And here we're talking about MacX Video Converter Pro, a video compressor with dozens of preset profiles including the HEVC, so that you can transcode 4K H.264 to HEVC to save up to 50% storage space. Meanwhile, it also enables you to reduce H.264 file size through adjusting parameters like frame rate, bit rate, resolution etc. If you're not so much sensitive to video quality, you absolutely can lower video frame rate, lessen the bit rate, downscale resolution to reduce your recorded H.264 MP4 file size without visually quality loss. 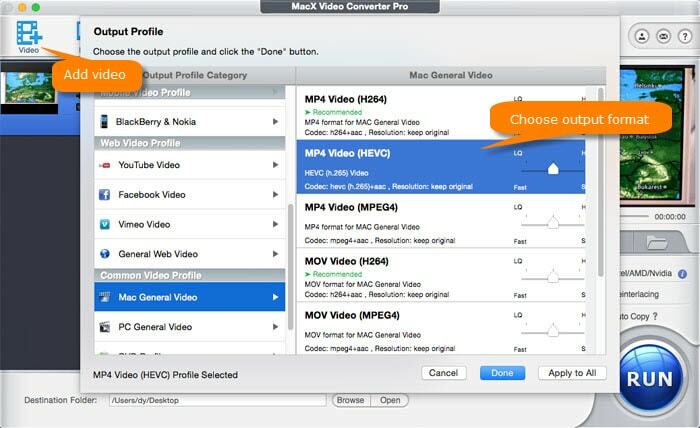 Again, prior to everything, free download MacX Video Converter Pro according to the platform of your laptop. This H.264 compressor is both available on MacOS and Windows. Step 1: Adding H.264 Files to the program. Launch the program on your computer and click + Video or simply drag and drop to add your target H.264 files. You can add several files at once to ease compression in batch. Take an iPhone 4K video at 60fps as an example. Scroll down to Mac General Video, choose MP4 Video (HEVC), and tap Done button to convert 4K H.264 to HEVC with half size reduction but same high quality retained. Step 3: Adjust parameters to make further H.264 files reduction. If you want to shrink H.264 file size ulteriorly, click on to enter an interface for adjusting parameters like resolution, frame rate, bit rate, aspect ratio etc. - Resolution. Keep the original 4K resolution, or you'd better compress 4K UHD to 1080p/720p to ensure a lossless video quality. - Bit rate. To some degree, bit rate is relevant to the resolution. Adjust the bit rate within the range: 2-5Mbps for SD, 5-10Mbps for 720p, 10-20Mbps for 1080p, and 30-60Mbps for 4K. Yet there are also case that program shows in VBR bit rate, which means you cannot change it manually, but it will be adjusted according to the image complexity. - Aspect ratio. This should be related to your screen display resolution aspect ratio. For example, to watch it on iPhone, iPad, keep the original 16:9 aspect ratio, to upload to Instagram as a square video, click button, choose Crop & Expand and Enable Crop to select 1:1 aspect ratio. Step 4: Trim H.264 video length if needed. Undoubtedly, video length matters a lot on video size. If you're not satisfied with result after the above settings, or simple need a shorter video for uploading or emailing, click on button, select Trim and check the box of Enable Trimming. Then you're able to type in the accurate start and end time of H.264 video or move the start and end modules to trim the length of video and split it into pieces. Step 5: Shrink H.264 video size now. Optionally, click on Browse button to specify path for zipped H.264 video. And tap RUN button, the H.264 video shrinker will finish all the rest within a few minutes. But it matters more for your video length and computer configuration. H.264 is claimed to improve bit rate efficiency over MPEG4 and MPEG2, but it still outputs large file size for 4K UHD videos. 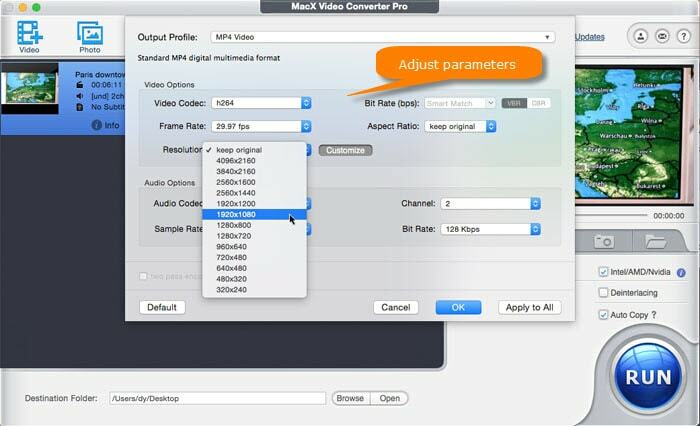 MacX Video Converter Pro enables you to shrink H.264 ulteriorly by transcoding h.264 to hevc, adjusting parameters like bit rate, frame rate, resolution etc., trimming 4K video length and cropping video dimensions. How to Compress iPhone 4K/HD Video Size without Quality Loss ? Uploading GoPro Video to the Web? Shrink It First!